This story was written by Donovan De Souza, walker of trails and creator of The Long Way's Better hiking guide. 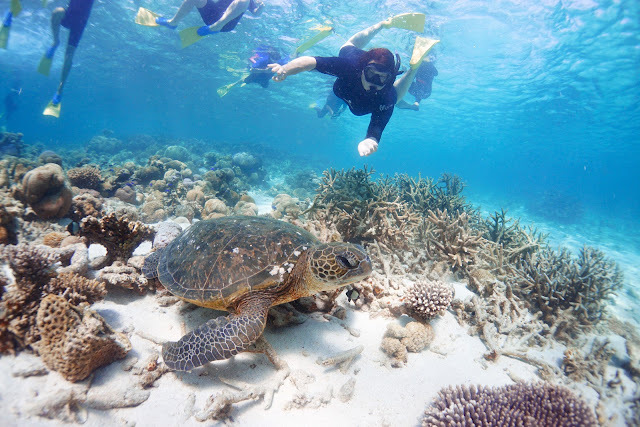 Australia's other great reef, the Ningaloo Reef offers some of the most accessible coral reef snorkeling in Australia. With easy access from Exmouth, the Turquoise Bay Drift Snorkel offers some of the best snorkeling just metres from the beach, while the Marine Eco Safari by Coral Bay Eco Tours provides an outstanding tour by boat to swim with the opportunity to swim with Manta Rays and Sea Turtles. While the Ningaloo Coast World Heritage Area has some incredibly beautiful and rugged walking through Cape Range National Park, the world heritage area is more well known for the beautiful Ningaloo Reef. Known sometimes as Australia's Other Reef (after its more famous east coast cousin the Great Barrier Reef), Ningaloo Reef is renowned for being the best place in the world to see Whale Sharks and one of the easiest coral reefs in Australia to visit. While the Great Barrier Reef can require lengthy boat rides just to get out to the reef, Ningaloo is more egalitarian - you can literally walk a few metres out into the water and be snorkeling with beautiful fish and coral. Visitors to Ningaloo can base themselves in either Exmouth or Coral Bay, with each having their own strengths. Exmouth provides much better access to Cape Range National Park, with a number of the beaches providing outstanding snorkeling opportunities. While we visited Lakeside and the calm side of Turquoise Bay, the Turquoise Bay Drift Snorkel was easily the pick of the bunch. A really beautiful beach, Turquoise Bay features a moderate drift current that sweeps across the beach before turn west and out to sea at a sandbar. While the current can be dangerous for weaker swimmers, moderate to strong swimmers with the aid of snorkeling fins will find that there is a lot to see. In spite of being wildly popular, Turquoise Bay featured some of the best fish life we encountered on all our snorkels, with a clown fish siting being one of the major highlights. A lot of the coral in Coral Bay is fairly brown and dull looking, which may lead you to think the reef is dead. At the time of writing, Ningaloo Reef is actually in fairly good health, and the brown colouring is merely the natural colour for many of the coral species along the reef. Nevertheless, there are still a number of colourful examples all along the reef, with yellow and blue staghorn coral being the most common. Even if a lot of the coral is not particularly colourful in the shallow waters of Turquoise Bay, the fish life more than make up for it. The waters are filled with such strikingly beautiful fish as the Blue Angelfish, which are relatively common in these waters. It was really interesting to see how the coral reef give the area a lot of its geographical interest, and creates little nooks and crannies for animals to live in. The coral reefs really are the forests of the oceans, and it made Alissa and I even more appreciative seeing them in person. Alissa and I did about five drifts of Turquoise Bay, getting out just before the sandbar and then walking back up the beach for another pass over this beautiful and extremely accessible part of the reef. Moving onto Coral Bay, Billy's Beach is the main beach and is a short walking distance from the many caravan parks and resorts of this small settlement. Literally 10 metres into the water, visitors will be greeted by a dense garden of coral that stretches out as far as the eye can see. The fish life was less brilliant here than it was at Turquoise Bay, but the sheer scale and density of the coral provided the area with an interesting point of difference that made it special in its own right. As Alissa and I had not visited Ningaloo during the Whale Shark season, we were not able to go on a tour out to swim with the majestic giants Ningaloo is most well known for. While swimming with Humpback Whales is now an option, we decided to instead do the Marine Eco Safari tour with Coral Bay Eco Tours to swim with Manta Rays and Turtles. At the time of writing, the $180 asking price makes it a reasonably affordable alternative, and is something I would thoroughly recommend. 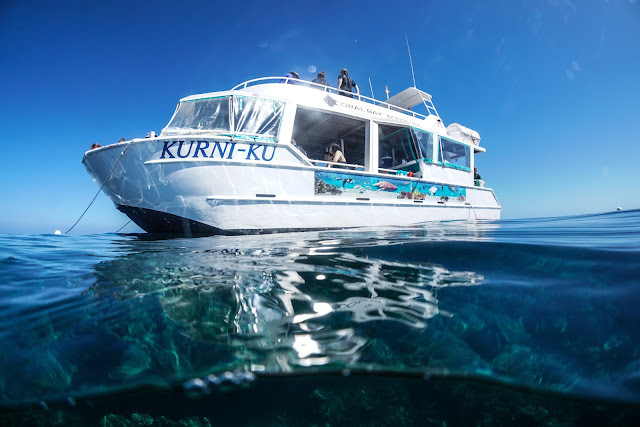 The Eco Safari takes snorkelers to the jetty south of Coral Bay via shuttle bus, before the Kurni-Ku heads out into the bay. Even the simple act of cruising out onto the crystal clear waters is an enjoyable experience, as the waters are some of the bluest and most crystal clear I've ever seen. On the day of our tour, we were fortunate enough to have glass out conditions, with the best clarity that the tour guides had had for months. I love the beaches of Australia's rugged South West, but the fact that this water is so shallow for so far out and is filled with coral reefs makes the water of Ningaloo all that more impressive and beautiful. Bonny from Wild Western Australia had suggested in her blog that swimming out 500 metres or more would yield excellent results. At the time I read it, that seemed crazy to me, but seeing the shallowness of the water such a far out swim is actually quite achievable and not as scary as it sounds. Our first snorkel for the tour was a visit to a easy snorkel spot at the edge of a deep chasm in the reef. The purpose of this snorkel was probably to give both the tour guides and snorkelers a chance to get a feel for the various levels of snorkeling ability. My confidence as a swimmer had been quite heavily crushed by the strong currents we had encountered swimming in the caves of Vietnam on the Tu Lan Cave Explorer, however I realised quite quickly that Alissa and I were probably at the upper end of skill relative to many of the others on the tour, with quite a few requiring pool noodles or deciding not to snorkel at all. Daniel Thomas Browne is the tour's official photographer, and his Instagram feed is filled with excellent photos from the tour. He had a serious underwater rig, and we were glad to pay a small fee for his photos. It is rare for Alissa and I to get photos together while out on an adventure, and it was well worth it. After swimming around the deep canyon, the tour took us to a turtle breeding area. Having not read the tour information properly I was surprised that we were just looking at the turtles from the boat, however we would later get an opportunity to swim with the turtles at our final snorkeling spot. The next part of the tour was the one we were most excited for - swimming with the Manta Rays. 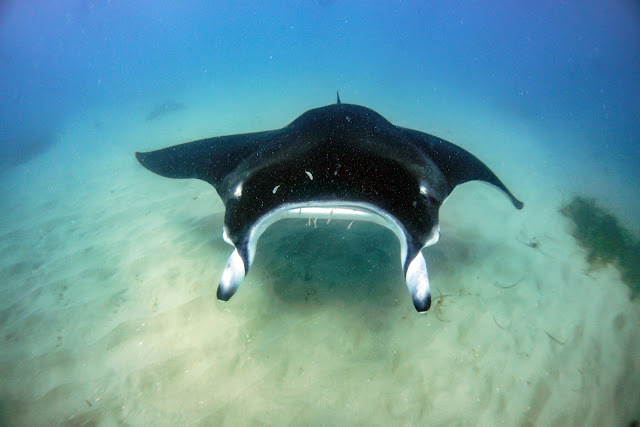 Unfortunately on the day of our visit, the mantas were in relatively deep and murky water. While the experience was definitely enjoyable, the photos were not quite as exciting as I had hoped. Since Daniel had the opportunity to dive deeper as the scout for the Manta Rays, he was able to get some really excellent close up photos. Even up close, it is clear that the visibility was not the greatest on the day of our visit, but it an incredible and awe-inspiring experience all the same. After lunch and a bit of a cruise around the waters, the tour took us to our final snorkel spot. Immediately upon entering the water, Alissa and I were blown away - this was the clearest water of our entire trip, and with the most abundant marine life of any location we had snorkeled over our entire trip. The highlight of this part of the tour was getting to swim with a number of turtles. Alissa and I had the privilege of swimming with turtles out at Julian Rocks when we visited Byron Bay, but with clearer, calmer waters this was even better. At this part of the reef, I was lucky enough to be able to photograph a number of the more uncooperative fish that had eluded me when I was trying to photograph them at Turquoise Bay. Although Alissa and I have snorkeled before this year, our visit to Byron Bay made us realise just how much we enjoyed this fun recreational activity, and was one of the reasons we decided to head up to Ningaloo beyond the walks of Cape Range. 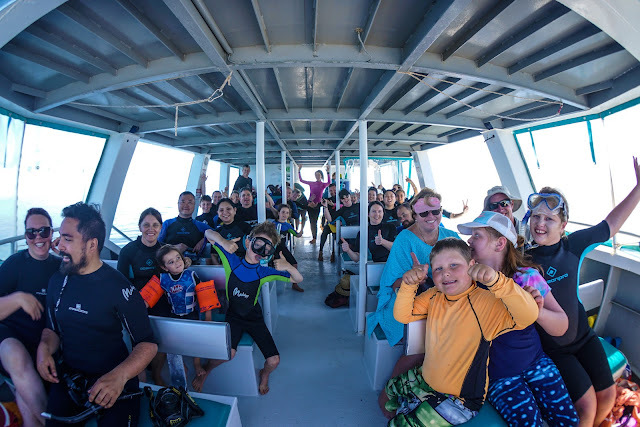 Ningaloo Reef definitely did not disappoint, with the ease of access to spectacular corals and vibrant marine life making both the drift snorkel at Turquoise Bay and the Marine Eco Safari wonderful experiences. Alissa, who has snorkeled in the Whitsundays section of the Great Barrier Reef thought what she saw at Ningaloo was better and far more accessible, and made us a bit disappointed at ourselves for not having visited Ningaloo earlier. This has to be one of our favourite national parks in Australia, and the combination the rugged Cape Range and the snorkeling on the reef makes the Ningaloo Coast World Heritage Area a must do. This story was written by Donovan De Souza, walker of trails and creator of The Long Way's Better hiking guide. This article was originally published by The Long Way’s Better blog, who experienced this Ningaloo Reef experience independent of Australia’s Coral Coast tourism. Australia’s Coral Coast did not review or approve this story.